While the previous chapter may be more famous for the controversial questions that have been raised about it, chapter ten seems to be the space where Marx provides the theoretical explanation of the relation the prices of production to the larger scope of his value theory. It is a really fascinating chapter containing a lot of important details about how Marx conceived of the relation of value to everything from supply and demand to average profits. Up until volume 3 the relation of value to price has just been assumed but here Marx actually spells out the specific relation, the mechanisms by which the fluctuations of supply and demand and competition assert the law of value. Throughout we should remember Marx’s central premise. The apportioning of labor in a market economy happens through the exchange of the products of labor in the market. We discover the social character of our private labor when we bring products to market and compare them to other products. Thus our labor is indirectly regulated through exchange. If I produce commodities inefficiently and bring them to market I will be forced to sell them at their average market value, even if this means that I get less then average profit. This will force me to alter my production, to reapportion labor, bringing it in line with the average productivity in my given sector. Thus labor time is indirectly regulated through this market exchange, this constant comparing of labors in the abstract, in the market. This can only happen if there is a relation between price and labor time. The law of value explains this mechanism of indirectly regulating the distribution of labor through commodity exchange. Some critics have complained that Marx’s theory of prices of production totally severed the link between price and value, that the price of a commodity which had been v+c+s (variable plus constant capital plus surplus value) had now become v+c+p (v+c+ profit)- that there was no longer a causal link between s and p. Marx begins chapter 10 by explaining what this link is. Prices of production, as learned in chapter 9, are equal to k+kp’ where k is the cost price (c+v) and p’ is the average rate or profit. This average rate of profit is a reflection of the relation of the total surplus value to the total cost price. This aggregate rate of profit reflects an average or mean organic composition of capital. Some individual firms actually approximate this same social average, this same organic composition. These firms of average organic composition have an individual rate of profit that is equal to the aggregate rate of profit. In other words the aggregate rate of profit is a reflection of the profit rates of firms with an average organic composition of capital. All other firms, no matter what their organic composition, tend toward the profit rate of these firms of average organic composition. As we can see from the equation k+kp’ there is still a relation between surplus value and prices of production. Not only are the aggregate equalities (total price=total value, total profits=total surplus value, and total money rate of profit= total value rate of profit) valid, but the individual prices of production are a function of individual values as they relate to the average composition of capital. The end result is that surplus value is redistributed amongst capitalists in the form of profit, giving each capital an equal return on investment, regardless of the organic composition. This is what Marx means by “equalization” in this opening paragraph. So how does this process of equalization happen? Marx begins by reminding us that the process of assessing value happens in the market when the products of labor are compared with one another. We don’t know the value of our private labor until we compare our labor’s product with the products of all other labors in the market. This is a necessarily clumsy process of fluctuating averages, never a direct process of assigning fixed values. Value is created in production for exchange. It exists prior to exchange. But it is realized in exchange. Without exchange it would never come into its own as value. Aside from reminding us that this equalization of the rate of surplus value is necessary for an equalization of profit rates, Marx is also giving us important information about how laws and tendencies work in a market. The indirect mechanism of the market requires fluctuations above and below the averages to which a law pertains. Socially necessary labor time is established through the comparison of private labors in the market, labors which may be higher or lower than the social average. It is through this comparison in the market that labor is disciplined, returning to production with the intent of achieving this social average. Similarly with surplus value, the competition in the market presses exploitation to a social average. But this average is achieved through all sorts of fluctuations. In both examples these fluctuations are not a defect. They are the mechanism through which the indirect market mechanism exercises a law. This is why Marx reminds us that this law is “”viewed as a tendency like all other economic laws.” There has been criticism of Marx for his use of the term “law”, or for his fluctuation between “law”, “tendency” and “law of a tendency”. I see no inconsistency if one realizes that all laws are tendencies in a market. It is ignorance in this matter that causes people to act like Marx’s laws or predictions are some sort of fixed, prophetic statements. Critics love to point to “exceptions”, to point to places where price deviates from value or where the movement of wages and profits is contrary to the direction Marx said they would move. But such primitive criticisms fail to understand the most basic starting points for Marx’s understanding the way economic laws work. This said about laws, Marx continues on describing the way average profits are achieved. “The whole difficulty arises from the fact that commodities are not exchanged simply as commodities, but as products of capitals, which claim participation in the total amount of surplus-value, proportional to their magnitude….” This leads Marx into a thought experiment in which he compares two different types of commodity production. This section is often read as comparing simple-commodity production to capitalist commodity production. I am suspicious of this reading (for reasons I mention below) but it does help frame this part of the reading if we use those terms. For much of the next 10 pages or so Marx will be elaborating on this comparison. To avoid confusion (and I was confused at some points) one has to be aware when Marx is talking about ‘simple commodity production’ (or some abstract concept of production where prices equal values), or capitalist commodity production where prices of production prevail. I’m pretty sure that elsewhere in this Kapital 3 blog I have talked about simple-commodity production, but let me just summarize a few points here again. I sometimes picture the concept of simple commodity production as a sort of “mutualist” economy like that envisioned by free-market anarchists like Ben Tucker or Kevin Carson. But Marx lists many different types of non-capitalist exchange like primitive societies trading between each other, medieval guilds, trade between slave and serf societies, and trade between “communist communities”. Individuals own their own means of production and meet in the market to exchange them. Here prices equal values, supposedly. It is a point of debate to what extent Marx treats simple commodity production as an historical phenomenon or merely a theoretical abstraction or whether he treats it at all. One side argues that the period in history in which private production really took the form of commodity production, of producing for the sake of exchange, only really emerges with the emergence of capitalist production, of private ownership of means of production coinciding with a dependent proletariat. David Harvey argues this, briefly, in his Limits to Capital. Isaac Rubin has a more sustained argument to this effect in his “Essays in Marx’s Theory of Value.” The other side argues that we can see simple commodity production in independent farmers or medieval guildsmen… that simple commodity production proceeds capitalist commodity production historically. There is paragraph in this chapter that asserts this and a footnote referring back to a passage in Volume 1 which makes the same point. I know that Engels further developed this point elsewhere (citation?) and I wonder if he inserted this part into this chapter. Hilferding argues this point in his response to Bohm-Bawerk and Mandel also defends a version of this in his introduction to Volume 1 of Das Kapital. I tend to side with Rubin that simple-commodity production is a theoretical abstraction and not an historical argument. The third side argues that “simple-commodity production” doesn’t even really exist as an economic concept in Marx, that it is imposed on Marx by later interpreters. (See Chris Arthur’s “The Myth of Simple Commodity Production“) When Marx talks about C-M-C it’s not that he is theorizing a state of society in which individuals necessarily own their own means of production and sell their products in the market. It’s that all economic interaction in the market take the form of market exchange, of products being alienated from their producers and existing as exchange values in the market. Even labor power is sold as a commodity. Marx begins with this commodity relation because this is the primary relation that all other relations presuppose. But it’s more complex than that! In order for this commodity relation to exist there must also be capital! It’s often pointed out that workers sell their labor power in the market because they own no means of production. But even more fundamental is the fact that workers seek their means of subsistence in the market and alienate their product for exchange value only in a society in which they are separated from the means of production. This means that the C-M-C/M-C-M relation is necessarily dialectic. We can’t have commodity exchange without capital. I’d love to hear recommendations from others of texts which address this relation more clearly. It certainly would serve as a starting point for making a distinction between both Marx and market socialists and Marx and mutualism. In a hypothetical “simple commodity economy” workers own their own means of production, producing commodities for market. They don’t hire other workers and they don’t invest in other enterprises, thus there is no capital and no exploitation. In such an economy prices equal values. In addition to making back the cost of production and paying for their means of subsistence all workers receive a surplus value in proportion to the amount of time they work. If all workers worked an 8-hour day they would all receive the same surplus value but the prices of the commodities and the rates of profit would differ for different types of commodities. Why? Every commodity requires a different ratio of raw materials, tools and labor (the technical composition) to be produced. Giving haircuts just requires scissors. Making a house requires all sorts of tools and building materials. The costs of these materials enter into the value of the product. So even if each worker in a simple commodity economy works the same amount of time their products will have different values. A day of haircuts will cost less than a day of house building. The price of a product must cover the cost of all these materials, the cost of the means of subsistence and a surplus value. If a worker is not able to make back the cost of their production or make this average surplus value they will be forced to alter their production or even switch to another type of production. (Notice that surplus value still exists even without the existence of capital.) If we apply the same terminology that we use for capitalism and talk about profit and rates of profit we will notice that each worker in a simple commodity economy makes the same amount of profit but has different rates of profit because the cost of materials is different. But unlike a capitalist economy these differing rates of profit don’t matter. They are “immaterial”. What matters is that an equal amount of labor receives an equal amount of value. The additional costs of materials are entirely compensated for by the differing costs of the product. 1) Exchange must cease to be accidental and become regular. If production is primarily happening for personal subsistence and not for exchange then the comparing of the products of labor in the market place will not be regular enough for these comparisons to have an enduring impact on production. The law of value requires regular exchange in order for production and exchange to act upon each other (dialectically). Here we might also mention those bourgeois theories of the LTV going back to Adam Smith that imagine primitive man operating under the law of value merely because he must weigh the utility of his product against the disutility of his labor (Smiths “toil and trouble”). Marx doesn’t deny that any labor entails a subjective valuation of the usefulness of the product in relation to the amount of labor expended. But he maintains that something entirely different and unique happens when we exchange those products in a market. We don’t place any utility on the products of our labor. We produce them merely for their exchange value. This changes everything. (Actually even in a less developed economy where exchange is of surplus products left over after producers have produced their means of subsistence it is still true that this surplus product has no direct utility for the worker. It exists merely to be exchanged.) The law of value does not pertain to all work in all societies. It pertains to commodity exchange. Incidentally, Kevin Carson, whose book “Mutualist Political Economy” I’ve been reading recently, makes this same mistake in his attempt to create a “subjective reformulation” of the LTV. 2) Commodities must be “produced on both sides in approximately sufficient quantities to meet mutual requirements, something learned from mutual experience in trading and therefore a natural outgrowth of continued trading.” This means that there production for exchange must be regular enough that the laws of supply and demand can operate freely. When supply and demand equal each other then prices equal values. But as Marx says later in this chapter supply and demand rarely meet. Their deviation is the mechanism through which the law of value works. Changes in one produce changes in the other. The division of labor is coordinated through the market. This is not the way Austrian subjective value theory views the situation. Subjective valuation only works if we take the mass of products on the market as given. Passive consumers must encounter and preexisting world of commodities. 3) No monopolies can exist which allow producers to sell products above their values. This qualification also helps dispense with some of the Austrian strawmen. Obviously Picasso paintings are not priced at their labor time. This is because Picasso paintings are not freely reproducible goods. The high price of a Picasso can not attract other producers to paint Picassos. Thus the law of value cannot exert itself. The law of value explains the way in which commodity exchange apportions social labor. In cases of monopoly there is a barrier to this apportioning of social labor. Monopolists get their excess profits by excluding other people from a sphere of production. (Keep in mind we are still talking about simple commodity production and not capitalist commodity production.) Within a sphere of production, say house builders, it may be that some work more efficiently than others. This could be due to individual differences in ability or to differences in the conditions of production from one place to another. Some carpenters may have access to better materials or tools, or be building in easier locations. When these differing products meet in the market place, when these various carpenter labors are compared, what determines the market value? Marx says it is the average value that determines the market value. Carpenters working above the average will receive a surplus- they sell at the market value but for less labor. Carpenters working below the average productivity will receive less surplus- they sell at the market value but for more work than the others. Thus, most of the time, the socially necessary labor time is set by the average productivity, production under average conditions. Notice that already with the concept of market value we see price diverging from the specific labor-inputs of individuals and moving toward social average. This means that some individuals receive more or less value in exchange than they produce. This is only possible because money embodies abstract labor. I believe we can take this term “market value” to be a stand-in for socially necessary labor time though I thought it odd that Marx doesn’t say that here. On top of this term “market value” we have “market prices”. Market prices are the actual money prices we see on price tags. Any seller can put any price on a price tag they like. It is the competition between sellers in the market that will determine if these prices can be realized. It is this competition which will determine if these market prices correspond to market value. It is this constant testing, competing and fluctuating that makes up the process that determines market value. But there may be times when this market value is set by the the price of production under the worst conditions or under the best conditions. I believe that the point Max is developing here is in response to prior theories of market value which argued that production under the worst conditions is what sets market value, but I am not sure about this point as I’m no expert on classical political economy. (Anyone who can weigh in on this would be appreciated.) I do know that later when we look at Marx’s theory of rent we will see Marx argue that agricultural prices are an exception to this general rule- that in agriculture market prices are set by the value of production under least favorable circumstances. Here Marx merely lays out theoretically what it would mean for market value to be set by production under the worst or best circumstances. Such a situation arises when demand does not respond to changes in price. Under most conditions a rise in price triggers a decrease in demand and a fall in price triggers an increase in demand. Thus, at a given price a product “occupies so much place in the market.” I like this image of “occupying so much place in the market”. “Place in the market” captures several things at once. At a given level of productivity of carpentry, so many houses are demanded, so much income is spent on houses, so much labor is devoted to building houses. If the level of productivity changes then this “place in the market” changes. But what if demand does not respond in this usual way to a change in price? What if demand stays the same when prices rise? Then market price will be equal to the value of goods produced under the least favorable conditions. If demand stays the same as market prices fall then prices will be set by those producing at the most favorable conditions. Marx does not give examples here of such special circumstances. Marx now returns to prices of production and capitalist commodity production, briefly. These same laws of market value apply to prices of production. Prices of production are the center of gravity for fluctuations in market prices. (See Alan Freeman’s “An Invasive Metaphor: The Center of Gravity in Economics” for a critique of this concept. It’s probably wrong for me to say “center of gravity” since Marx doesn’t actually use that phrase, but I can’t think of a better phrase at the moment.) Under normal market conditions it is these prices of production of firms with average conditions which set the market value. But special circumstances may cause the best or worst conditions to regulate the market price of production. 1. Changes in prices relate to changes in productivity. Even if prices deviate from values, changes in prices correspond to changes in the amount of labor time required for both the production of a specific commodity and for the formation of the general profit rate. Marx postulates that Ricardo understood this when he emphasized the relation of changes in labor productivity to changes in price. I am not by any means an expert in Ricardo but my understanding is that rather than pursue a direct, proportional labor-to-price relationship Ricardo preferred to emphasize how changes in labor led to changes in the price. (Anyone who can offer some clarity on this is welcome to write in.) One of Marx’s big contributions to value theory is to go beyond Ricardo and explain this relationship in more detail. 2. The average profit is equal to the average surplus value. In other words, total profits can’t rise above the total amount of surplus value. Marx then goes on to demonstrate that any attempt to argue that total profits can be higher than total surplus value is just to increase the monetary expression of labor time. (Modern marxist economists call this the MELT. MELT is an important concept because the value of money in relation other commodities changes and thus the amount of value represented by, say, a dollar bill changes as the MELT changes.) If some capitalists raise their prices so that there appears to be higher profit rates, this necessitates all other capitalists raise their profit rates so that they can afford to buy from each other. Wages must then rise too so that the product of the consumer goods sector can be bought back. When all prices and wages rise it is the same as if no prices or wages rose. Competition is the mechanism for the creation of both market value and prices of production. Within a sphere of production competition forces producers to sell at the market-price, an average price set by the firms operating at average productivity in average conditions. Between spheres of production competition forces producers to sell at their prices of production, cost price plus an average profit rate set by firms operating with average organic compositions. “For commodities of the same sphere of production, the same kind, and approximately the same quality, to be sold at their values, the following two requirements are necessary:” So that you don’t get lost in the argument, Marx will take about 14 pages to explain these 2 requirements. Briefly they are: 1. Individual values must be equalized as one social value (p. 180-185); and 2. Supply and demand must balance (p.185-194) This second point breaks into two tangents, the first on supply (p. 186-188) and the next on demand (p.188-189) before then discussing supply and demand together (p.188-194). (Again, all page numbers apply to the Progress Publishers, Moscow edition. )This entire time we are talking about production within one sphere so we don’t need the concept of prices of production. On page 194 Marx will return to talking about prices of production. This a long section with lots of interesting details so it’s important not to get lost in the structure of the argument. Now for a closer look. First: Individual values must be equalized as one social value (p.180-185). For there to be a market value, the private labor of diverse individuals must appear on the market to be compared with one another. Enough of each product must be produced to meet social demand. If there is a shortage in relation to demand then prices will rise above values. If there is an excess then prices fall below values. Through such fluctuations a balance is achieved which brings about a market price which equals the value of commodities produced at average conditions. In this sense supply and demand regulate market value. But we must also realize that supply and demand are also a response to market value. Demand changes in relation to the price of a product. Changes in demand will trigger a change in supply. The ratio of demand to supply must be determined by an underlying cost of the commodity, the cost of production, and all costs are ultimately labor costs. We often hear people unfamiliar with the subtleties of the labor theory of value object that it is not value, but supply and demand that regulate prices. The response to this statement should be, “What regulates supply and demand?” Above I summarize how Marx shows how productivity is the ultimate determinate of the ratio of demand to supply. Beyond this there is there is this nebulous element of “social demand”. How much is demanded by society depends not just on the individual tastes of consumers but also on how much money consumers have to spend. The demand for wage-goods depends on the amount of wages paid to workers. The demand for luxury goods, capital equipment, raw materials, etc. comes from the amount of surplus value appropriated by the capitalist class. Thus class struggle over the rate of exploitation, and the distribution of surplus value between the different parts of the capitalist class is the foundational concept needed for an analysis of social demand. Yet bourgeois economy would have us think that demand is purely a matter of consumer preference. The reality is that if I have no money is doesn’t matter what kind of toothpaste I prefer: I can’t buy any. This idea that supply and demand regulate price but that price regulates supply and demand has a nice dialectical ring to it. Little surprise then that Marx reminds us here of one of the first dialectical pairings he presented us with in Volume 1: exchange-value and use-value. All commodities have an exchange value and use-value. In the transaction of money and commodities these two types of value get polarized, commodities embodying use-values, and money exchange-value. In order for a commodity to have an exchange-value (price) it must be compared against all other commodities on the market as they compete to fulfill social needs. In other words, it must have a social use. The production of this social use must not exceed the average bounds of productivity in a given sphere of production. Thus socially necessary labor time is established. One of the hip things about Marx is that it is easy to zoom in and out from micro to the macro viewpoints using the same concepts. In the same way we said all of the above about individual commodities the same can be said of a mass of commodities in one sphere. If we take all the cars sold this year we can say that the aggregate prices of these cars equals the aggregate social value of these cars, and that this mass of cars contains the socially necessary labor time needed for its production. Within this mass of cars some are produced at less the optimal conditions while others are produced at more than optimal conditions. On the whole, these exceptions balance each other out. Competition forces less-optimal firms to work toward the social average so that most firms produce at an average level. While some firms still lag behind an equal amount rush ahead of the average, balancing out the laggards. Thus it is the average productivity, the mean value, which determines the value of commodities in a sphere. But what if there is an excess of these lagging firms with not enough firms producing above the average to balance them out? Then prices will be determined by these laggers, these firms producing at least-optimal conditions. The opposite happens with an excess of firms producing above the social average. In an overstocked market prices are always determined by those producing at optimal conditions. If market-values are set by production at average conditions then the total individual values are equal to total price. But in the cases where prices is effected by the least or most optimal conditions then the total of individual prices exceeds or falls lower than the total of individual values. A fascinating paragraph, especially in light of the strong emphasis placed on demand in much of the criticism of Marx by Austrians/marginalists. Up until now we have assumed that commodities satisfy a social want, that they are demanded. This is because value is a social concept. In market exchange private labor becomes social. Of course if there is no demand for a commodity it will have no value. This dispenses with the common straw-man attack on the LTV which claims that Marx is saying that any product of labor, no matter how ridiculous, has value. Even more interesting, much of the logic of value in marginalism has to do with opportunity cost- that as a society decides how to allocate “scarce” resources it must choose between different commodities and that the cost of forgoing other options is what is measured in prices. Here Marx begins to talk about the way social need is formed through the comparison of all the different commodities on the market in all the different spheres of production. This entails an analysis of supply and demand. Before treating supply and demand separately Marx reminds us that above we have already talked about the way different production conditions effect the formation of market values. If supply meets demand then market values will correspond to the values of commodities produced at average conditions. But if demand is higher than supply then market values are formed by the firms operating at the least favorable conditions. If supply outpaces demand then market value is formed by firms operating at the most favorable conditions. Supply and demand can get out-of-synch through changes in either supply or demand or both. Now Marx looks at supply and demand separately. This all seems simple so far until we realize how tricky this idea of demand is. First of all, demand comes from both consumers buying wage-goods and capitalists buying means of production. These two groups have different motivations in forming demand. The working class demands its subsistence. The capitalist class enters the market looking for profit. Both groups change their level of demand according to the prices they encounter in the market and the amount of money they have available to buy commodities. The prices change with productivity. The amount of effective demand is formed by the rate of accumulation and the surplus value. Of course supply and demand never balance completely. If they do it is by accident. So what is the purpose of talking about them as if they do? Marx gives two reasons. 1. In order to get at a fundamental relation, we have to hold other variables constant. For instance, if we are to study gravity in its pure form we hold forces like friction constant. (If a more scientifically-minded person has a better example please suggest one.) 2. The deviations caused by fluctuations in supply and demand are deviations around a mean. A deviation in one direction is compensated for by an opposite deviation in the other direction. We could say that viewed over a longer period of time, supply and demand do balance out, that the longer the period of time, the more all those pesky interferences in the market like monopoly, imperfect information, trends, etc. appear little more than blips on the screen. But of course, values are moving over time so this idea becomes one of a moving mean. What the long-view gives us is a view of market values as the dominant force amidst the daily fluctuations of the market. Supply and demand explain the deviations of prices from market values, but they also explain the tendency to eliminate these deviations! This is what it means to say that supply and demand is the mechanism by which value is asserted. If supply outpaces demand and prices fall below values this triggers changes in production which bring price back in line with value. Hence the law of value asserts itself. To help us out of this circularity Marx introduces the concept of “effective social want”. That is, at a given price there is a given level of social demand. If the actual value changes then effective demand will change and thus supply will change. A new balance point between supply and demand will be established. Over time, as productivity changes, there may be many different balance points established between supply and demand. These points may represent very different quantities of product, amounts of aggregate value and amounts of labor time. Within the fluctuations caused by this balancing of demand and supply remain the market values which correspond to the socially necessary labor time. For the past 15 pages or so we have been talking about the formation of market values within a sphere of production. This involves the way supply and demand cause prices to coalesce around values. But this all started because Marx wanted to explain the formation of prices of production which involve the deviation of prices from values. We looked at simple commodity production and we looked at production within in one sphere to see how the process of supply and demand work in apportioning labor to meet effective demand and understand the way deviations in price form the mechanism by which the law of value is asserted. But now we must return to the question at hand: prices of production. Fortunately much of the analysis has already been done for us through this exploration of supply and demand, market value and competition. Different spheres of production have different organic compositions and thus different individual rates of profit. Capital flows into spheres with above average rates of profit which increases the supply of those commodities. This eventually lowers prices below their values which brings that profit rate back down to the average profit rate. The opposite happens with firms with higher organic compositions and therefore lower individual profit rates. Thus, instead of realizing the money price of the value that firms throw into circulation, the issue becomes one of realizing an average rate of profit for the amount of total capital invested in production. This transfer of surplus value in circulation is only possible because money acts as the embodiment of abstract labor. In order for this to happen capital needs to be easily invested in and out of different spheres. This requires mobility of capital and labor, a credit system, and the subordination of each sphere to capitalist production. If some spheres resist the penetration of capitalist relations, like small scale farming for instance, these spheres do not enter into the formation of an average profit rate. In order for labor to be mobile there must be a greater concentration of the working population, work must require less skill and workers must be desensitized to changes in work. The reduction of skilled labor to simple labor is crucial. Many contemporary Marxists critique the idea that profit rates actually ever equalize. The point out that this is merely a formal theoretical problem and not one that relates to the real world of capital where profit rates are wildly unequal. I don’t know too much about this idea. It’s one of the ideas behind Farjoun and Machover’s book “Laws of Chaos” which I’ve only just begun to peek into. I’ve also heard TSSI people criticize this idea of equalized profit rates. I’m not sure whether these thinkers think that a failure to equalize profit rates means that commodity prices are closer to values or not. Average profit depends on the total mass of surplus value created. Thus each capitalist takes part in the collective exploitation of the working class. Exploitation is truly a class phenomenon. Though Marx doesn’t drive the point home here, this class aspect of exploitation is obscured through the prices of production. Profit appears to accrue to individual capitalists as a result of their own investing prowess. It is not clear that the benevolent CEO of Patagonia is just as implicated as the CEO of Shell Oil in the collective exploitation of the working class. We see why it was necessary for Marx to treat the labor-capital relation first before he entered into this analysis of the way the surplus value is distributed amongst capitalists. Of course the drive to exploit comes from the advantage an individual capitalist will get if he/she produces more efficiently than the social average. They can make above average profit rates if they can raise their rate of surplus value above the social average. In fact this urgent race to improve efficiency leads to the rising organic composition of capital. Likewise a particular sphere of production has in its interest the same goals vis-a-vis the rest of the economy. If that sphere can produce more efficiently than the social average then they can reap surplus profits relative to other spheres. To the extent that all spheres contribute to this assault upon the wage-laborer, they all work together as a class to exploit the wage laborer. very well put! i really liked the way u explained the LTV, it kind of remind me of the systems theory’s (and complexity science) approach… altough im no huge fan of hegel, I guess that’s cos of dialectics. 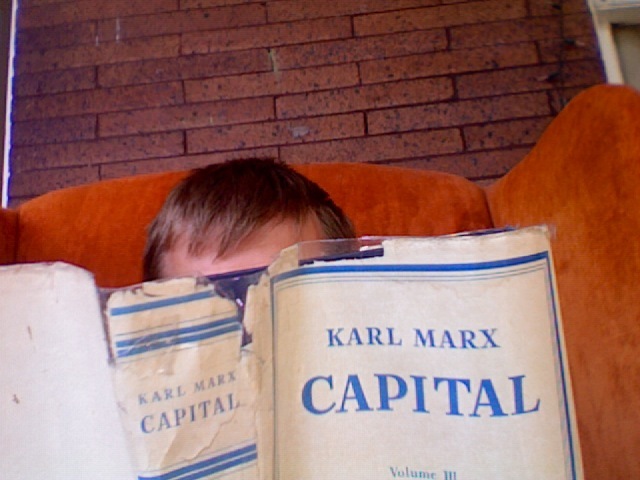 I’ve not read much of the 3rd book of Capital, so i’m having some trouble… I didnt get the mechanism of rate of exploitation equalisation. Some time ago i read a paper that said that ‘refuted’ this tendency because workers do not know (and have no possible way of knowing) the rate of exploitation, so the driving force would be, more specifically, wage. For wage to act as a mechanism of equalisation of rate of exploitation, shouldn’t we ignore the production of relative surplus-value? Possible the best one-liner I have seen that puts the Austrian crowd back in their place!! But doesn’t “subjective” mean personal, arbitrary, idiosyncratic? Therefore, it applies MORE to the world of largely self-sufficient producers with accidental encounters and occasional exchanges, rather than “tak[ing] the mass of products on the market as given.” Opposite of what this reviewer is claiming. A cow might be worth a plow, regardless of labor time embodied in the traded product, if it is rarely encountered. If there is no way to get a plow otherwise, and no way for the cow owner (who might have too many cows) to make the plow on their own, it makes sense to make a trade of something of lesser utility to that individual for the thing of more utility. Likewise, the plow owner might have no cows, so that will be more useful to her. Hence each trades the item of lesser utility away for the thing of more utility, subjectively and personally considered. It would then only be with the further development of a regular system of exchanges and production for exchange that labor value would emerge as the central controlling regulator of market prices. Value would historically come to have hegemony over utility as the determining factor for price. But this only comes after, emerges from, the more isolated world of self-subsistence production with occasional exchange. Marginal utility describes a barter world of Robinson Crusoe economics. Marx actually critized the distinction of “subjective” and “objective” value in his marginal notes on Adolph Wagner. how surplus value is DISTRIBUTED than how surplus value is actually produced. “Neo-Ricardian Marxists” (Meek, the later M. Dobb, by way of straffa’s stuff) repeat this error— although Maurice Dobb’s work is in other respects admirable. A nice brief overview of this can be found in Murray E.G. Smith, Invisible Leviathan (University of Toronto Press,1994), esp his chapters on the contemporary value controversy and his assessment of it (pp. 82-139). You can skip right to this section, if your fancy is so tickled. I am confused by this passage of yours. A typo on your part perhaps? Maybe I am too drunk right now. You’re right. It should be “total profits can’t”. I’ll correct it. Thanks. You the man. You say “Between spheres of production competition forces producers to sell at their prices of production,” Why? Is this because if a sphere has greater than average profits the mobility of capital and the drive for more profits pushes more and more capital(sits) into this sphere and thus increases productivity and lowering the profit rate to roughly the general rate? I’m also a bit fuzzy on how the trading at prices of production effects an equal distribution of surplus value between spheres…the explanations/ notes I’ve seen tend to just say “thus” without making clear how/why this happens. I’m going to re-read this post, but any comments/help would be appreciated! Question 1: The answer is yes. Think stock markets, banks, etc. Money moves quickly between spheres of production. If one sphere has a higher rate of profit, more capital flows into it. Eventually this decreases the rate of profit in this industry. This movement toward an average rate of profit is a TENDENCY. Nobody is claiming that profit rates between industries actually equalize in the long run. There are barriers to entry, immobility of labor, etc. But if Marx is to make sense of his value theory then he must deal with this theoretical tendency. There is a take on the transformation problem that argues that since profit rates don’t actually equalize in reality that we don’t need to worry about the transformation problem. I don’t take this view. I think that since it is a tendency, even if not a realized tendency, it needs to be addressed as a theoretical issue. 2nd question: Prices of production mean that if you invest $1 you will get an average rate of profit on this $1 regardless of the organic composition of capital. How is this possible? Because surplus value is redistributed in exchange. How is it redistributed? My best explanation of this is in my video on Socially Necessary Labor time. If you sell a product for more than its value you gain SV through exchange. The opposite happens if you sell below a products value. Firms with high organic compositions sell above value. Firms with low organic compositions sell below value. Does that help? It’s tricky stuff at first…. Yes, indeed, it helps immensely. Especially with the latter question, it’s just helpful to know I am thinking along the right lines. I have watched the video on SNLT, but will re-view it…I may have been packing when I watched it. And I appreciate the response! Going through Vol. III without a sounding board of some kind is like… doing something difficult. Really quite. I don’t think this is what Marx wants to say at this point. Marx divides the commodity product of a certain branch of production (producing the same kind of commodity) into ‘average’ conditions of production, below average conditions of production, and above average conditions of production. But ‘average’ here means ‘median’, not ‘mean’: it’s ‘average’ in the sense of the category in the middle. Marx then says that when the values of the commodities in the other two categories (above and below) balance each other out the ‘average’ market price (i.e. the market value) is the same as the price of the commodities in the middle category. But ‘average’ in this last sentence is now means ‘mean’, not ‘median’: it is the sum of the values divided by the number of values. When the commodities in the upper and lower categories balance each other out the mean market price coincides with the median market price (i.e. the market price of the commodities in the middle category). But when there is a relative preponderance of commodities in the lower category, or vice versa, then the mean market price does not coincide with the median market price, i.e. the statistical average price does not coincide with the individual price of the commodities in the middle category – respectively, it lies below, or above it. But in all cases – *disregarding supply and demand* – the sum of the prices = total market value. Clearly, where the translation says ‘…then the market value falls below the average value’ it should read something like: ‘…then the market value falls below the value of the commodities produced under the middle conditions.’ Translation of ‘den mittlern Wert’ in the sentence ‘… so fällt der Marktwert unter den mittlern Wert’ as ‘average value’ is clearly wrong. In one sense this is not so important: it is Marx settling a score with Ricardo more than anything else. But it *is* important I think to understand what Marx is saying when he goes on to talk about supply and demand to see that the sum of market prices will not deviate from social market value in function of the conditions of production (which means productivity of labour) but rather in function of the social allocation of labour time. Market value is formed through competition within a particular branch of production, such that commodities of the same type and quality sell at the same market price. This market value, which is a ‘single social value’, is distributed among the commodities in exchange such that each expresses an aliquot part of it. So the relationship between market prices and market value is a dialectical one: market value can be nothing other than the arithmetic mean of market prices *because* the market price of an individual commodity is an aliquot part of the total social market value. But what determines the magnitude of market value? The amount of labour a given society ‘decides’ to allocate to a given type of commodity. But because commodities *are* commodities, this ‘decision’ is made ex post facto, when commodities are exchanged, not before they are produced. Hence the labour allocation represented by market value and the labour embodied in the commodity on the market may not – probably will never – coincide. If too much labour is invested in the production of a given commodity – ‘too much’ in the sense of more labour than society can absorb through consumption – then the market price will fall. This is the (dialectical) operation of supply and demand. But fall below what, exactly? Marx’s formulations are of the type that ‘market prices fall below market value’, but I think this can appear misleading. What happens when there is an excess of supply (i.e. a lack of demand) is that the market value in the sense of the mass of labour that society can absorb in the consumption of the product stands below the mass of labour (in the form of the sum of production prices) embodied in the commodities on the market. Market price falls below market value in *this* sense: the value on the market. When this happens capitalists realise a profit below the average (i.e. the average profit determined by production *between* sectors of production) because the sum of market prices stands below the sum of production prices: social market value as determined by social demand stands below the value present on the market. And when too little labour is invested in the production of a given commodity, the converse happens, and capitalists realise a super-profit. Not sure if this is all too accurate. Simple commodity production involves primitive technology (peasants working on their land with primitive tools, guild manufacture, etc) and individualized production (at best there is the co-operation in guilds, but producers are generally autonomous families). Mutualism is a proposal for a specifically industrial economy where Worker’s Self-Management of industry and a system of “Mutual Banks” that don’t charge interest play a major role at the center of the economy. Some basic economic forces behind it and small commodity production would be the same (C-M-C and equal exchange of value for one), but it’s still a quite distinct idea. I think Marxists sometimes apply critiques of small commodity production to Mutualism with out paying due attention to the differences. I was reading some of Marx’s writing the other day and noticed one critique of small commodity production: He argued individualized production prevented the birth of industry and co-operation, so the annihilation of this mode of production was historically necessary and inevitable. Mutualism gets around this by not being a system of individualized production but rather worker’s self-management. In your “What is capitalism?” post where you explain how the incentive for M-C-M1 comes from inside small commodity production, as a market society requires some way to keep money circulating, and no one would exchange money for money with out receiving more money. The Mutualist “Mutual Bank” (a quite complex idea with many different versions and developments) seems to solve this, as this institution keeps money in circulation offering interest-free loans, and is maintained for the mutual aid of the members who manage it (interestingly, it offers a use-value – security and mutual aid – in exchange of keeping money in circulation rather than exploit and accumulate value for it’s own sake). Whether Mutualism is possible, reachable or desirable and whether Mutual Banks can exist in the first place is a different story altogether, but i think we can consider this theoretical system to be different from both Small Commodity Production and Capitalism alike. There is, however, one idea that does propose a return to Small Commodity Production, it’s called “Distributism”. They are a group of Catholic social thinkers who propose the re-distribution of property to all people and the re-organization of the economy on the basis of guild manufacture and the abolition of banking.